Lyle: Listen to the Lesson Sample and you'll hear the riffs you will learn in this lesson. Three chords make up this 12 bar blues progression in the lesson sample - C7, F9 and G9. The scales to use for playing B.B. King style riffs against these chords are C minor pentatonic and C major pentatonic. Learn these basic patterns for these scales; you'll be learning riffs and a solo made from these scales. The highlighted, circled notes are the C (root) notes of these scales. Lyle: The other scale you should know is the C major pentatonic. Notice this pattern is similar to the C minor pentatonic, only 3 frets lower! Lyle: In this next TAB file, you'll see how the two scales can be used with the jam track. You'll start off with the maj pentatonic, then switch to the minor pentatonic and back again. B.B. King doesn't really play scales in this fashion; I just want to show you a good exercise with these scale patterns. Lyle: Learn this series of riffs that combine bending and vibrato, which make up the B.B. King style. These are just like the ones from the last two lessons, only in a different key, C7. 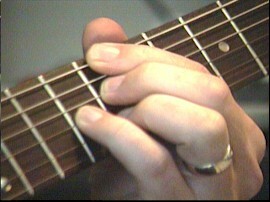 Riff 1 is based around the major pentatonic notes. Lyle: Riff 2 is based around the minor pentatonic notes. Lyle: Here's a video clip that shows riffs 1 and 2. Lyle: Riff 3 and 4 are from the minor pentatonic notes. Cabe: Have you ever heard the term B.B. 's box? It has really helped my leads. I used to be stuck in the basic pentatonic shape. Lyle: Cabe, I believe you're referring to a pentatonic pattern. 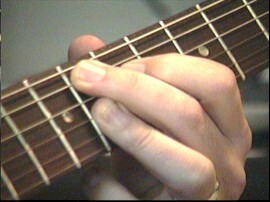 The C minor pentatonic 2 pattern at the top of the lesson is the B.B. box pattern. Many riffs are played right from that shape. Lyle: Riff 5 and 6 are almost the same except for the bend amount, half step bend on riff 5 which makes it a minor riff, whole step bend on riff 6 making it a major riff. Lyle: Riff 7 is from the minor pentatonic notes. Lyle: Here's a solo example made up mostly of two simple riffs. Notice the space between the riffs. You don't have to constantly be playing something. Play a riff, then "take a breath" and play another riff. Lyle: Here is another 12 bar solo. This one is a better example of playing around the groove. Listen to solo 1, you'll hear the organ play, then the guitar plays a blues riff. You can pretend that B.B. is singing something during the organ part and you are playing the fill-in riff! mac: Question: On the G9 and F9 is the root based on the 5th string? Lyle: Yes mac. 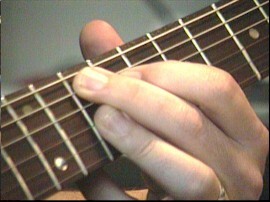 F = 8th fret - 5th string, G = 10th fret - 5th string. Lyle: Here's how I played the rhythm guitar in the jam track, hitting a short chord burst on beat 2 of every measure. Notice in the video clip my right hand keeps time by bouncing to the beat, but only hitting the strings on beat 2. Lyle: These last three B.B. King lessons all had a jam track and groove set to a "B.B. King sound". In the next two lessons I want to show you how to play the B.B. King style against other jams that might be in a slightly different style, like ZZ Top as an example. Basically, anything with a blues groove I bet B.B. could jam on, so that's what we'll look at in the next two lessons.